The City of Boston was dealt several setbacks recently in a lawsuit against them over the city's approval of the Boston College institutional master plan. In the case of Galvin et al. vs. Boston Zoning Commission et al., Superior Court Justice Charles Spurlock [right] issued a preliminary ruling on June 29th that there are "sufficient facts to support an inference" that the BC Task Force, an official advisory body of the Boston Redevelopment Authority (or, in the judge's words, "a subcommittee of the BRA"), is a government body, and hence subject to the state's Open Meeting Law. The ruling was issued in response to a series of pre-trial motions by lawyers on both sides of the case. The ruling is significant in that it is consistent with the ruling of Suffolk County District Attorney Dan Conley in June 2007 that the BC Task Force and the Harvard Allston Task Force are government bodies that are subject to the state's OML, a ruling that the city continues to dispute. Two Brighton residents, Patrick Galvin and Mark Alford, filed their lawsuit against the city in July 2009 in response to the city's approval of BC's IMP. The BRA Board voted in January 2009 to approve the IMP; the Boston Zoning Commission approved it, with modification, in June 2009; and Mayor Thomas Menino subsequently signed it. Justice Spurlock's order, while not a final ruling in the case, indicates that the task force will continue to be a defendant in the lawsuit. To date the task force has not, to my knowledge, responded at all to the complaints nor have they been represented in front of the court by legal counsel. Implicit in the judge's ruling is that the lawsuit will go forward into additional phases, such as discovery and, potentially, trial. This alone suggests that there may be a protracted legal battle over BC's IMP that could impact the university's ambitious expansion plans. This preliminary ruling by Justice Spurlock appears to be a major headache for the city, since its lawyers argued strongly to try and keep the task force out of the lawsuit. Now not only is the task force in this lawsuit as a defendant, but the judge has made an initial ruling that would appear to imply that all of the BRA's task forces are subject to the state's OML -- and, by extension, the state's Public Records Laws and ethics laws. Let's hope the task force members -- now confirmed by the preliminary ruling to be part-time, unpaid municipal employees -- are doing a better job at retaining their emails than some other city employees who have recently been in the news. The judge also turned down two separate motions by the defendants that would send the case to Land Court and expedite it. While not noted in the ruling, the judge appears to have allowed Boston College earlier this spring to join the lawsuit as a defendant without objection from the plaintiffs (as expressed in a December 2009 hearing). BC's lawyers have been filing motions repeatedly with the court -- including the Land Court and expedition motions -- actions that are normally allowed only for parties to the case. The plaintiffs did not, however, win on every issue. 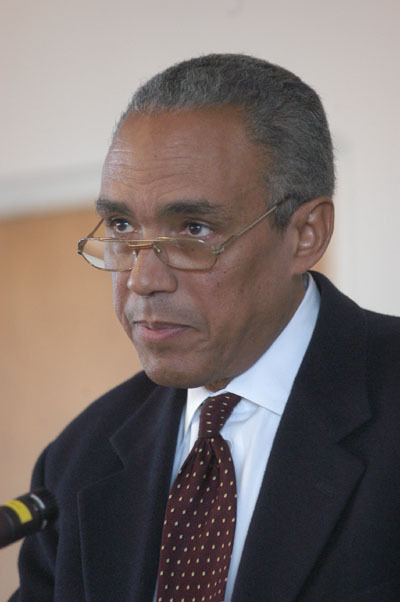 The judge: ruled that their allegation of OML violations were filed too late according to the statutory 21-day limit; rejected their attempt to make a claim for violations of civil rights and their rights under the Equal Protection Clause; said that he would not consider possible criminal violations of the state's ethics laws, since those should be brought in front of the district attorney instead; that the individual members of the task force could not be named separately as co-defendants in the lawsuit, appearing to lift their individual liability (while not ruling on the government body's collective liability); and that the task force itself did not impact the rights of the plaintiffs, because the task force was only an advisory body to the BRA. I suspect that that last ruling will be hotly contested in the case, and that we haven't heard the last of it. The ethics issue, too, promises to be complicated as the case moves forward. While ruling that this civil action is not the appropriate venue for a criminal allegations of conflict-of-interest against individual members of the BC Task Force, the judge also stated case law that ethics civil violations are administrative matters that are rectified by processes within governmental agencies. But if the BRA Board and BZC relied upon recommendations from their advisory panel (the task force) that were allegedly biased due to financial conflicts-of-interest, then nothing in the ruling appears to prevent the plaintiff's arguments from going forward in seeking to invalidate approval of BC's IMP in a tainted process. Spurlock was assigned to the case earlier this year after the previous judge, Christine Roach, recused herself after repeatedly suggesting her potential conflicts to the lawyers. Update: The Boston Bulletin has a story on the ruling.